View the Official Ranking List for the 2012/13 Men’s European Cup and the Official Place Distribution for 2012/13 Men’s EHF Club Competitions. 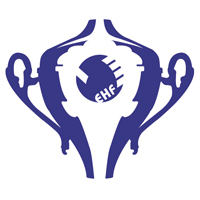 At its meeting in April 2011 the EHF Executive Committee approved the merger of the Men's EHF Cup and the Men's Cup Winners’ Cup as of the 2012/13 season. At the same time the EHF Competitions Commission worked out a proposal for the place distribution in the EHF Club competitions as of 2012/13, which was first made available to the Professional Handball Board at its meeting in Cologne at the end of May and afterwards was passed on to the EHF Executive Committee for approval. Following the confirmation of this proposal by the EHF Executive Committee at the meeting in Malta in June, the distribution of places for the 2012/13 Men's Champions League, the new 2012/13 Men's European Cup as well as to the 2012/13 Challenge Cup has been decided. This, of course, being only three competitions for the very first time and not four anymore after the EHF Cup and the Cup Winners Cup will be merged. Since the distribution of places was a crucial element in the preparation of this new European Cup competition, the various bodies within the EHF will now continue with evaluations and proposals regarding further areas of the new competition, such as the playing system, the distribution of rights as well as minimum standards for organization and playing halls together with other issues. At the same time the 2010/11 season is concluded in all competitions and the ranking list for the club competitions list is therefore ready for the 2012/13 season. This is particularly important with respect to the new situation in the 2012/13 season with only three competitions as mentioned above. The available "Ranking list 2012/13" makes clear the position in the ranking of the Men’s European club competitions. This ranking list serves as the basis for the distribution of places for the club competitions in 2012/13. Please remember that the ranking for the 2012/13 season is based on the results in all Men's club competitions of the seasons 2010/11, 2009/10 and 2008/09. There is a major change in this ranking at a crucial point as SLO has passed SUI and DEN and is now occupying position six. Consequently SLO will have two places in the Men's Champions League in 2012/13 while DEN will drop to position seven and will have only one place. The relevant information for the Women’s Club competitions will follow in due time.